Take Wilson Ave or Lawrence Ave east off of Lake Shore Drive – the roads loop towards the beach. 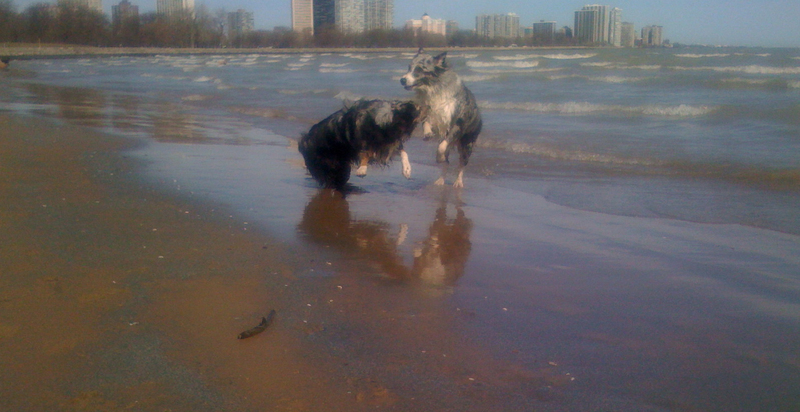 Our dog beach is located on the Northwest corner of Montrose Beach (the point closest to the city). Look for the big corrugated steel walls of the old Boat Launch, and you’re there.The entrance to Mondog is at the old boat launch structure. The Montrose Dog Beach is Chicago’s first legal off-leash beach. Mondog started out in the summer of 2000 as a group of people with nothing more in common than the love of Montrose Beach and enjoying a good walk with our four-legged friends. We were brought together by our founder, Susan Kimmelman, with the intention of making legal what had been a long standing practice of early morning and evening walks on the beach.After 2 years of patience, persistence and compromise, and the unexpected passing of our beloved Susan, we were granted a corner of the beach for a pilot area, and we’ve been there ever since. So why do we need Mondog? After all, isn’t it the Park Districts’ responsibility to take care of the Dog Parks? Well, yes and no. The Chicago Park District charter for Dog Friendly Areas (DFA) requires that every Dog Park has a community organization to sponsor it. Once the Dog Beach became an official DFA it fell to Mondog to oversee the area, and to represent the dog beach community. The Park provides us with some services, but it is up to us to keep our area clean and safe. Our members help clean the beach daily, inform newcomers of the rules, and exert a positive influence over the dog beach. We try to solve problems within the community, and alert the authorities when necessary. We keep in touch with the Park District, and with other Community organizations who have an interest in our great park system. We work to provide information to the members and make improvements to the beach. You don’t have to be a member of Mondog to visit the dog beach, but if you are a regular beach user you should consider becoming a member of Mondog. It’s the best way to show your on-going support for the Dog Beach. Our strength is in our numbers, and we need your support to allow us to keep supporting Chicago’s first off-leash dog beach.